Other horns on the internet are 2 - 3 inches at the mouth and 6 - 8 inches long, but these Plausibly Period™ brand horns are huge and very unique. A brass band is on-laid about 2 inches from the top with a beautiful design. The other difference in a Plausibly Period™ Horn is that they are sealed with heat resistant, food safe sealant. So don’t settle for a cheap knockoff. 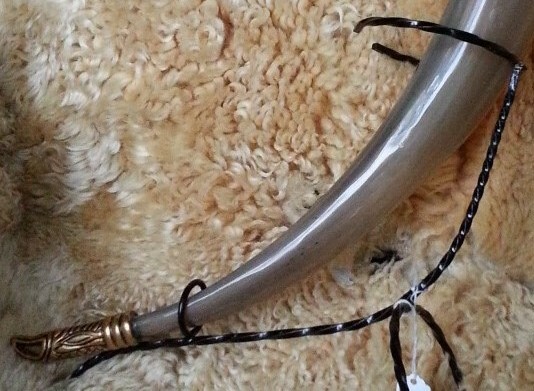 Get your genuine Plausibly Period™ Brand Viking Drinking Horn today! Each of the horns we sell is different. The natural color of the horn combined with the minor variations in size and shape make each horn as unique as fingerprints. So every horn is one-of-a kind. The horns pictured are an approximation of the style they represent. The color pattern, size and shape of the horn we send you will not be exactly the same as pictured but it will be similar. The stand shown in some pictures is for display purposes but is available seperatly. Raw, unsealed, unpolished Pollished and Sealed . Click on any picture to view enlargement.